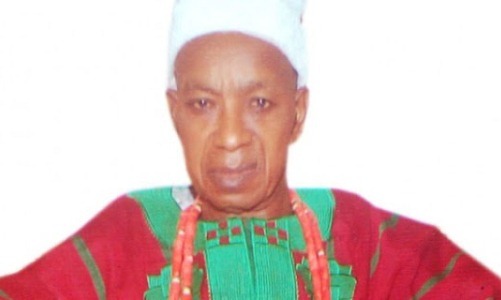 Unidentified gunmen yesterday Thursday February 7th shot dead a prominent Lagos white cap chief, 73 year old Onimole of Lagos, Chief Kayode Adeshina, at his Onimole Palace, Iga Iduganran Street, Isale Eko on the Island. Two gunmen were said to have scaled his fence at 3 am, robbed the home, and shot the chief dead after he told the gunmen he didn't have any money at home, according to people in the home. After the killing, the gunmen locked the chief up in his room and fled. So hw did he nw tell u dat he told d thief he didn't av money,wen he was shot dead. Any ways the wickedness of d wicked is on d high side. We all need 2 find refuge in God. How sad! I smell something politically induced or something here, seems like a clear assassination. May he RIP. So sad may his soul rest in peace. At anonymous 3:56, don't u know hw to read ,they said according to people in d house . Mstweeeeee. RIP sir. This isn't fair at all!! !OMG RIP sir...I hope this won't be one of those cases the police would giv up on. Itz so so sad! Who re d dey nah,y didn't d story include,his help said or his wife said. Duh! It's not rocket science! RIP chief, it's well judgement awaits U̶̲̥̅̊Я killers. Are U̶̲̥̅̊ pple daft or W̶̲̥̅̊н̣̣̣̝̇̇̇@̤̥̣̈̊̇†̥̣̣̣̇̇̇ or Ȋ̊§ Ȋ̝̊†̥ D̶̲̥̅̊α† U̶̲̥̅̊'r blind? Cant U̶̲̥̅̊ pple read Ãήϑ understand simple explaination or T̶̲̥̅ђe̶̲̥̅̊ grammar D̶̲̥̅̊ε̲̣̣̣̥γ̲̣̣ τ̅☺ơ̴̴̴̴̴͡ big fφя̩̥̊ una? Abeg make una D̶̲̥̅̊ε̲̣̣̣̥γ̲̣̣ open una eyes Ãήϑ brain well well wen U̶̲̥̅̊na D̶̲̥̅̊ε̲̣̣̣̥γ̲̣̣ read...S̲̅Ơ̴̴̴̴̴͡ D̶̲̥̅̊α† una no G̶̲̥̅Ơ̴̴̴̴͡ D̶̲̥̅̊ε̲̣̣̣̥γ̲̣̣ mis-yan! Thieves no get respect. Don't they hope to ever live up to 73yrs? Dis our country don spoil finish. isale eko is the next place to be sanitized, i witnessed hw a guy that was driving infront of me was attacked all because he was wound down & perhaps doors not pinned down. i hurriedly overtook him & left watching via the mirror. Just want to correct you blunder. It should be 'Those gunmen will be fished out by all means'. You dig. My sdear, poverty isn't a tenable excuse for deviance, marauding or being callous. O!Allah wat type of world is nigeria turning into?